Caution The Cisco RPS AC input power modules are power-factor-corrected to comply with certain International Electrotechnical Commission (IEC) standards. Do not connect the Cisco RPS to an uninterruptible power supply (UPS) that has not been tested and designed for power-factor-corrected power systems. Do not connect the Cisco RPS to a ferro-resonant transformer. If you do either of these things, you could damage the Cisco RPS. 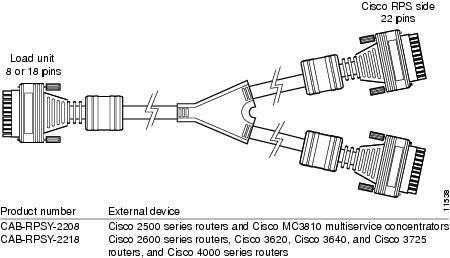 The Cisco 1516M hub (HP 10BASE-T Hub-16M) only supports a one-to-one cable for quasi-redundant configuration. This hub does not support connection of its AC power cable for redundancy with reboot or the use of the Y-cable for full redundancy. Refer to the “Connecting Hubs” section for illustrations and procedures. See the “Connecting Switches” section for illustrations and procedures. Refer to the “Connecting Routers and the Cisco MC3810 Concentrator” section for illustrations and procedures. With cables (Cisco RPS number PWR600-AC-RPS-CAB)—Includes four one-to-one (22-pin to 18-pin) cables for connecting to hubs and switches or for quasi-redundant support for Cisco 2600 series routers; Cisco 3620, Cisco 3640, and Cisco 3725 routers; and Cisco 4000 series routers. Note The fully redundant configuration is supported only for routers, not for hubs or switches. Figure 3-1 and Figure 3-2 show the cables you can order, and Table 3-1 includes cable descriptions and lists the corresponding product order numbers. For ordering information, contact 800 553-6387, 408 526-7208, or cs-rep@cisco.com. See also the “$paratext>” section. External devices operated with the Cisco RPS must have a Cisco RPS connector. Cisco 2600 series routers, Cisco 3620, Cisco 3640, and Cisco 3725 routers, and Cisco 4000 series routers, and the Cisco MC3810 concentrator do not automatically ship with an RPS connector. Note The FastHub 400 series hubs, Cisco 1516M hub (HP 10ASE-T Hub-16M), Catalyst 1900 series and Catalyst 2820 switches, and Catalyst 2900 series and Catalyst 3500 series XL switches ship with an RPS connector and do not require a power adapter plate. If you did not order your router or concentrator with a Cisco RPS connector installed, you must order a power adapter plate that provides compatibility and must install the plate in place of your existing power supply. Device-specific instructions for installing the RPS adapter plate are shipped with the plate and are also available on Cisco.com at http://www.cisco.com.